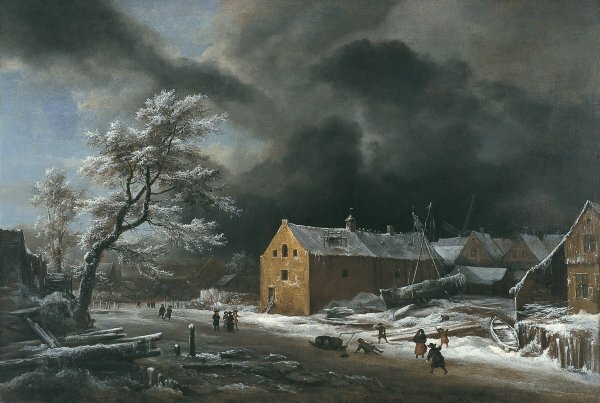 Winter landscapes depicting the effects of the season and set in the countryside or in cities and their outskirts had already been depicted by artists of the generations prior to Van Ruisdael such as Jan van Goyen, Aert van der Neer and Jan van de Cappelle. Around thirty oils of this type are known by Van Ruisdael, none of them dated, but almost all using a small format. It would seem that Van Ruisdael started to paint scenes of this type after he moved to Amsterdam. As in the summer landscape Road through Fields of Corn near the Zuider Zee, also in this collection, landscapes of this type were independent compositions and were not part of series devoted to the seasons of the year or the months. Van Ruisdael’s winter landscapes depict the fields and forests of the Dutch countryside under the effects of snow, as well as frozen canals beside villages and the countryside around farms and small hamlets. On occasions these scenes include large windmills whose shapes are outlined against the heavy winter sky. Van Ruisdael’s approach to the winter landscape was different to that of other artists as he conveyed the harshness of the season and its discomforts rather than emphasising the possibilities for sports and games. In the present canvas, which has a high viewpoint, the artist used a strong diagonal formed by the frozen canal that crosses the pictorial space. On the right in the bend of the frozen water we see a series of buildings of a functional type that have been identified as storage spaces for peat, a type of fuel that would have been transported by the boat moored alongside the buildings. Gaskell noted that the extraction of peat was one of the most profitable activities of the Dutch Republic and that it was transported by canal as it was a basic product used in various industries. On the left of the canvas is a tree that stands out due to its pronounced slope, the shape of the trunk and branches, as well as the contrast created by its bright, snow-covered branches against the dark sky. In the background planes, which almost blend into the heavy winter clouds of the sky, it is possible to make out a village. The brushstroke is rather carelessly applied in some areas, while the simplification and schematic nature of some areas of the composition and the figures (which include a group throwing snowballs, which is an unusual motif in Van Ruisdael’s work) led Gaskell to suggest that the painting may have been partly painted by another hand in collaboration with the artist. However, as that author also noted, little is known about Van Ruisdael’s studio. From the point of view of its date, the canvas has been compared to two other works by this painter: a Winter Landscape in the Boijmans Van Beuningen Museum in Rotterdam and a Winter View in the Rijksmuseum in Amsterdam.